Last night, the Kardashian family revealed a Christmas special on E! 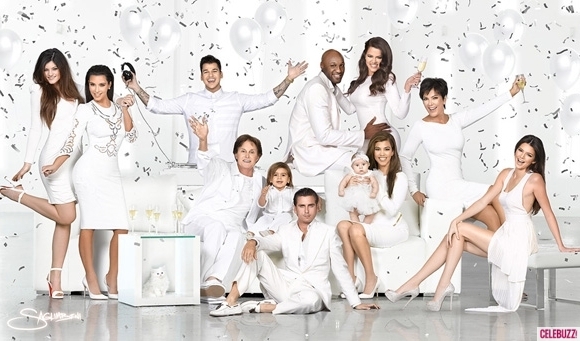 's Keeping Up With the Kardashians: A Very Merry Christmas edition. As you may (or may not) know, the Kardashian clang do an annual family holiday portrait which always tend to be quite civil and regal-like, but this year could quite possibly be the family's strangest shoot yet! Commissioning famed photographer, David LaChapelle, he photographed the family in the most bizarre looking set — transitioning their photographs into over-the-top, blinged out, carnival-like Christmas cards. The theme was so bizarre that sparkling gold money signs, illuminati pyramids, golden mannequins, abstract art and graffiti on the walls filled the room, while loads of magazine tabloids catered solely to the Kardashian family scattered all throughout the ground. Massive head shots of the Kardashian and Jenner girls creatively filled the space, and photos of Bruce's olympic glory days peeked through in vintage televisions and cereal boxes. Kim, Khloé, Kourtney, Kris, Kendall, Kylie and Bruce all posed in black — accompanied by little Mason and Penelope. This year, the family kept it tight knit with no sight of Rob, Scott, Kanye, baby Nori or Lamar. Nonetheless, it's safe to say that the Kardashian-Jenner family have gone way over their heads on this one. To be honest, I find these photos to be quite disturbing, and confusing, and sorta uncomfortable all in one. I can't quite explain it... I mean, you can't even tell it's a Christmas photo spread, yet alone a family protrait... Everyone looks so spaced out and artificial looking. Nothing really made sense. I'm assuming Kanye had something to do with this set up. I'm convinced. If you look closely, Kanye West's Rolling Stone's magazine cover lays in the centre of piled Kardashian tabloid covers that surround Kendall and Kylie. His cover actually does stand out amongst the rest. This guy is genius. According to Huffington Post, "The picture presumably represents the media circus the family is constantly in." Well put. Let's take a look at the Kardashian-Jenner family Christmas portraits throughout the years, courtesy of Celebuzz.